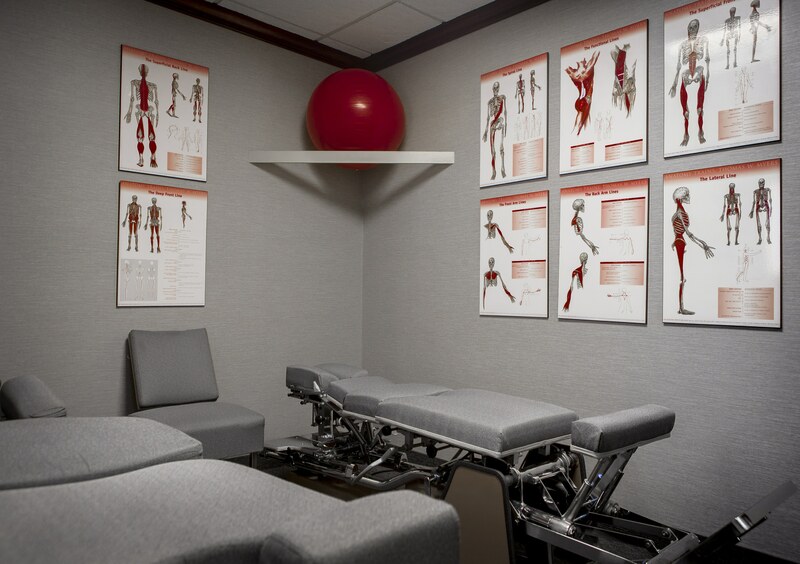 At Birmingham Chiropractic Clinic, we strive to make the new patient experience as comfortable as possible. After the formalities of some brief paperwork, the doctor will take a detailed history. A good history goes further than just the basic question of: “When did the pain start?” It highlights pertinent information to establish relationships between your past medical history and current complaints. Any history of past injuries and repetitive behaviors (i.e. sitting at a computer for 8hrs/day, carrying a child in one arm, heavy lifting, etc.) are analyzed to consider their relevance towards treatment. A new patient examination is performed next. It consists of range of motion, orthopedic, and neurological testing. A chiropractic evaluation follows, including the analysis of your posture, gait (walking), functional movement, and structural stability. Palpation of your muscles and joints is also performed by hand to determine areas of impaired spinal movement and muscle tension. For more information on the chiropractic evaluation, please click here. The information gathered from the history, physical examination and chiropractic evaluation helps the doctor determine the need for X-rays, or additional imaging. Spinal X-rays are commonly taken in the presence of trauma, arthritis and unresolved musculoskeletal dysfunction. The X-rays provide us with a blueprint of your spine and assist in determining the best course of treatment for you. A thorough evaluation process gives the doctor a tremendous amount of insight into the nature of your symptoms and the cause of your complaints. This allows the doctor to create a treatment plan that will address the primary cause of your problem, rather than chasing its secondary effects. The doctor will discuss the treatment plan, which is always aimed at achieving sustained results. You will be educated on the short and long-term benefits of chiropractic care and the expected outcomes of your personalized treatment plan. Once the scope of your condition is understood, treatment will begin. For more information on the variety of treatment techniques utilized in our office, please click here. Prior to leaving, you will be given instructions on certain activities and procedures to complete at home or to integrate as a part of your daily lifestyle. These may include any, or all the following: avoiding certain positions and activities, completing various rehabilitative exercises, performing specific stretches, taking a nutritional supplement, or applying heat/ice to tissues in need of healing. Note: You should expect that your first office visit will last ~1 ½ hours. You can download the clinic forms here prior to your first visit. Also, if you have had any recent X-rays or MRI’s that are relevant to your current problem(s), please bring them into the office on your first visit. Birmingham Chiropractic, in Birmingham, Michigan, has one of the finest practitioners of the art. His name is David Kirsch. He used to travel with us on the road, all over the world. He would basically keep our bodies in shape; he would apply kinesiology and sound health practices. He is a wonderful guy! My years playing hockey took a toll on my body. I am fortunate and very pleased to have found Dr. Joel Kirsch of Birmingham Chiropractic. I receive what I regard as world-class treatment, which has provided me with pain relief and restored mobility. My family also sees Dr. Joel, and we trust in his skill and care. I had severe pain In my lower back and limited mobility when I first came to see Dr. Sean Totten. After regular treatments the pain has subsided. With Dr. Totten's therapy and recommended home exercises I am back on the golf course! We strive to provide the most effective natural forms of treatment to aid in your health and healing. A strong emphasis is placed on patient education to ensure sustainable outcomes, long after you leave our office. Enter your email address to receive the latest news, special offers and promotions. Copyright © 2019 Birmingham Chiropractic Clinic. All rights reserved. Designed by Ponder Consulting ®.